Zane Smith claimed a hard fought sixth-place finish with the No. 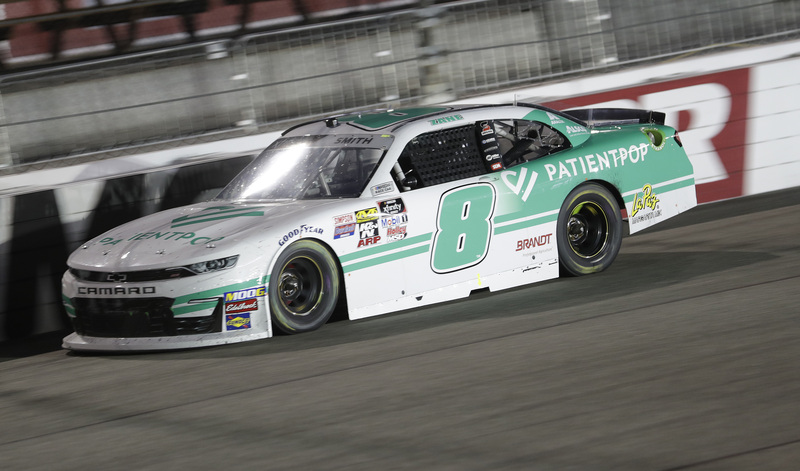 8 PatientPop Chevrolet in Friday night’s ToyotaCare 250 at Richmond Raceway. The effort marks Smith’s best finish in Xfinity Series competition and gives the rookie his first top 10 in only his third career start. It also stands as the No. 8 team’s sixth top 10 outing in eight races this season. After rain washed out Friday’s qualifying session, Smith started from the 10th position and took little time cracking the top 10. Through the course of the opening stage, Smith clung to a spot inside the top-10 but reported needing more “roll speed” through Richmond’s lengthy corners. Wisely managing his tire wear, Smith posted lap times equal to the front runners and pitted the No. 8 PatientPop Chevy with the field just prior to stage-ending caution. He went on to conclude Stage One in eighth. Taking the green flag for Stage Two in the same spot, Smith found himself in the thick of traffic from the outset, racing door-to-door and jockeying for track position for the stage’s duration. Following a caution that brought Smith to pit road and left 13 laps remaining in the second stage, the PatientPop entry lined up in 13th. Smith leveraged two more restarts into nine positions as he diced his way to fourth for the stage end. Smith kept a stranglehold on the frontrunners during the final stage. Though he fell back to sixth, the PatientPop pit crew netted him two positions under caution on the final pit stop of the night. He lined up for the ensuing restart in fourth, but was forced to give up positions due to a competitor’s lackluster restart, the result of which stacked up the field. Smith held on to cross the finish line in sixth. Cole Custer won the race. He was followed to the checkered flag by Austin Cindric, Justin Allgaier, Tyler Reddick and Ryan Sieg. “I have to thank PatientPop, La Paz Margarita Mix, The Cosmopolitan, and everyone who has gotten me this far in my career. This is unreal. It was really cool racing that hard with Ryan Sieg. He’s really good to race with. I feel like we were side-by-side for the whole damn race.